You may already be aware of an announcement made by the European Commission last March on the future of .EU domains registered to UK organizations and individuals. In short, once the UK officially withdraws from the European Union, individuals with an address in the UK and Gibraltar, and UK companies without a presence elsewhere in the EU, will no longer meet the eligibility requirements. Much to the disappointment of the domain community, the European Commission has decided against “grandfathering” the 300,000 .EU domains already registered with a GI or GB country code, an action which would have allowed existing owners to renew their domains indefinitely, despite the country code no longer being eligible. We would have appreciated a more creative solution than — it’s unfair that existing registrants simply lose their right to ownership. Regardless, it’s time to start preparing affected registrants for this change. Below you’ll find what each of these three scenarios would mean for .EU registrants based in the UK. If the UK leaves the EU on March 30, 2019, without having reached a withdrawal agreement, here’s what will happen. Starting at March 30, 2019, 00:00 CET, EURid will immediately stop allowing new registrations of .EU domains using a GB (Great Britain) or GI (Gibraltar) country code. For existing domains, EURid will no longer allow registrant transfers to GB or GI residents. 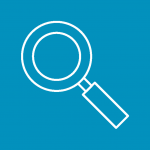 In March 2019, EURid will contact existing registrants who have listed a postal address with a GB or GI country code, giving them “the possibility to demonstrate their compliance with the .eu regulatory framework by updating their contact data.” For organizations, this would involve indicating a legally established entity in one of the eligible EU27 or European Economic Area (EEA) Member States. For individuals, this would involve updating their residence to a physical address located in one of the EU27 or EEA Member States. During this two-month window, UK registrants who wish to keep their domain active must update their contact information to satisfy the eligibility requirements or transfer the domain to an EU resident. On May 30, 2019, at 00:00 CEST, any registrant who has failed to demonstrate their eligibility will have their domain placed in Withdrawn status — the domain won’t resolve (and any linked services will become inactive), but the registration record will remain on file with the registry. At this point, the registrant is still able to reactivate their domain by updating their registration data to satisfy the eligibility requirements, thereby removing the Withdrawn status. On March 30, 2020, at 00:00 CET, all ineligible domains in Withdrawn status will be deleted and made available for registration. On March 2, 2021, at 00:00 CET, any registrant who has failed to demonstrate their eligibility will have their domain placed in Withdrawn status — the domain won’t resolve (and any linked services will become inactive), but the registration record will remain on file with the registry. At this point, the registrant is still able to reactivate their domain by updating their registration data to satisfy the eligibility requirements, thereby removing the Withdrawn status. 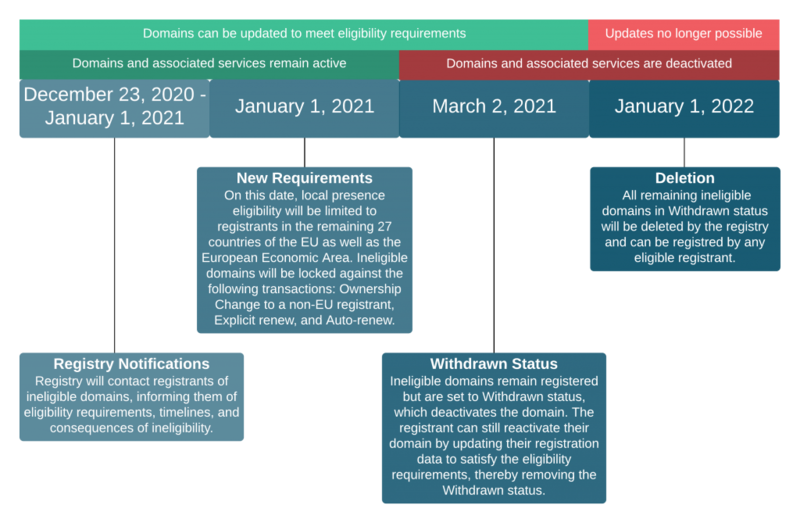 On January 1, 2022, at 0:00 CET, all ineligible domains in Withdrawn status will be deleted and made available for registration. As mentioned above, an updated .EU regulatory framework that will allow for .EU domains to be registered by EU citizens living in the UK will come into effect in 2019. Therefore, EU citizens living in GB or GI would NOT become ineligible as a result of the UK withdrawal. Depending on how EURid implements the new policy directive from the EU Commission, EU citizens living outside of the EU could potentially be required to actively validate their eligibility in order to maintain their registration. The EPAG team is exploring how best to approach this situation and find solutions to minimize the impact on registrants. 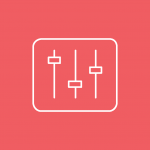 If you sell .EU domains we strongly encourage you to sign up for our newsletter so that we can keep you up-to-date on how these changes progress. Consider restricting multi-year renewals for UK-based registrants of .EU domains. This will help avoid situations where a UK customer pays a sizable renewal fee, only to lose their .EU domain a few months later. Consider restricting .EU registrations or displaying a warning. It’s important that before registering a .EU domain, your UK-based customers are made aware of the impending change to the domain’s eligibility requirements. We recommend displaying a warning to customers attempting to register a .EU domain using a GB or GI address or, alternatively, preventing these customers from registering .EU domains altogether. Keep in mind that the registry could contact your customers as early as March 23, 2019. We recommend preparing to contact your affected customers before March 23, 2019, so that, in the event of a hard Brexit, the notice from the registry doesn’t come as a surprise. Over the next couple weeks, we’ll provide more information that will help to inform your communications. Once again, if you sell .EU domains, we highly encourage you to subscribe to our Reseller Newsletter to stay up-to-date as things develop.